View your PDF as sheets in a Binder. No need to deal with multiple screens. PDF files of a given folder becomes sheets of a single binder. 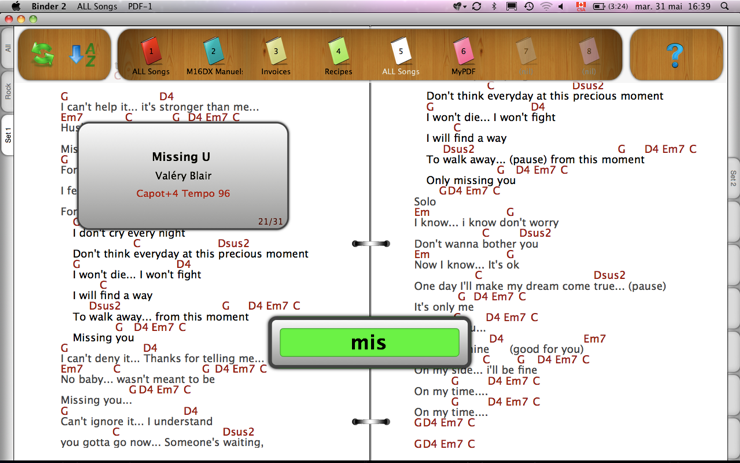 Binder automatically match the corresponding songs in iTunes when you use the integrated remote control. Binder is always in search mode. Type few characters or use arrow keys to find a sheet. No need to activate a search field. Binder is always ready! Assign up to 8 binders to 8 folders of your choice. Switch between binders using Cmd-1 to Cmd-8 shortcuts. There is also an Auto-Bookmark feature. Sort your song by title or author. Simply click on the Sort button or press on the Tab key to switch to a different sort order (Tite or Author). Complete integration with your favorite applications. Print, Mail, Preview your files directly from Binder. All these features are integrated to the main menu of Binder. Binder build its own indexes according to the name of your PDF files. Please read the user manual to get more information about the suggested naming conventions.